If Sen. Elizabeth Warren or her backers thought her defiant moment on the Senate floor last week would give her a boost for a possible campaign against President Donald Trump in 2020, a new poll shows she has some work to do. A Morning Consult/POLITICO national survey conducted Feb. 9 and Feb. 10 found that Trump leads the Massachusetts Democrat 42 percent to 36 percent in a hypothetical 2020 contest. When asked to choose between a generic Democratic candidate and the Republican incumbent, voters chose the Democrat over Trump, 43 percent to 35 percent. About a quarter (23 percent) said they had no opinion on the 2020 contest. Voters were polled in the days after Senate Republicans barred Warren from debate on the nomination of now former Sen. Jeff Sessions (R-Ala.) to serve as attorney general. Republicans said she broke Senate rules by impugning Sessions’ character when she read from a 1986 Coretta Scott King letter accusing Sessions of using his post as Alabama’s attorney general “to frighten black voters.” Warren trended online, with supporters coining the hashtag “#ShePersisted” — a reference to the admonishment delivered by Senate Majority Leader Mitch McConnell (R-Ky.) from the chamber floor. Get the latest data and news on politics and policy from Morning Consult by subscribing here. 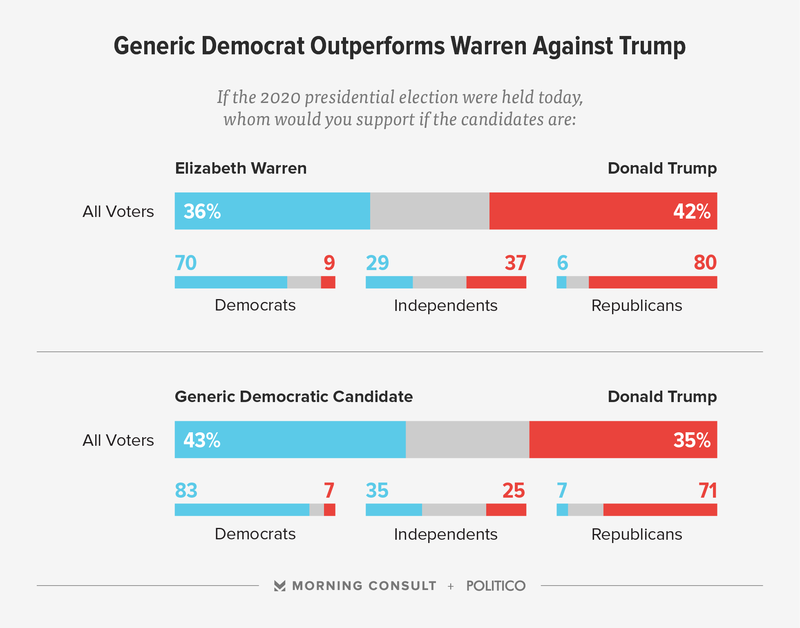 In the head-to-head matchup, Warren trails Trump 37 percent to 29 percent among independents, whereas a generic Democratic candidate wins those voters 35 percent to 25 percent. A generic candidate also outperforms Warren among Democrats and Republicans in a matchup with Trump. While 70 percent of Democrats said they’d support her against Trump, 83 percent were ready to back a generic Democrat. And while 80 percent of Republicans said they’d vote for Trump over Warren, that number dipped to 71 percent when those voters were asked to choose between the president and a generic Democrat. While the fiery progressive is a hit with many Democrats, she’s not particularly well known by 30 percent of the party’s voters. Still, almost 6 in 10 Democrats (58 percent) have a favorable view of Warren, compared with 11 percent who have an unfavorable view. Overall, 34 percent of voters said they have not heard of Warren or have no opinion of her. Among those who do know about her, 37 percent have a favorable view and 30 percent have an unfavorable one. Trump is viewed favorably by 49 percent of voters and viewed unfavorably by 45 percent. Like Trump, Warren has railed against special interests that have harmed working-class voters, and she holds some appeal among Trump supporters. While half of respondents who voted for Trump in 2016 said they view Warren unfavorably, 20 percent of them said they had a good opinion of Warren. Still, the voters who elected Trump in 2016 aren’t feeling any buyer’s remorse. Only 4 percent of the president’s supporters said they would vote for a Democratic candidate if Trump runs for re-election, while 24 percent said they didn’t know. The national survey has a margin of error of plus or minus 2 percentage points. See the full results here. Eli is a reporter at Morning Consult covering politics and campaigns.